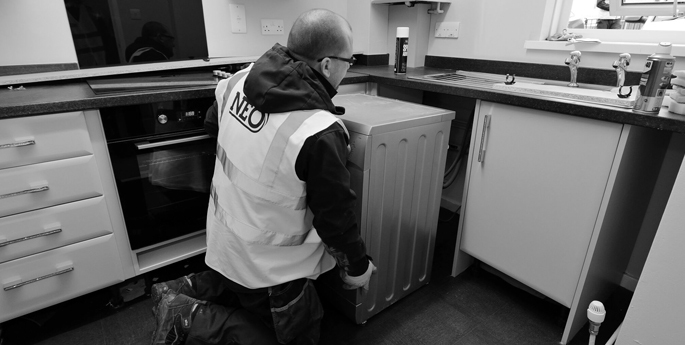 Delivering planned and reactive repairs and maintenance is where Neo Property Solutions makes a real difference. Significant emphasis is placed on maintaining effective communication with the varied groups of stakeholders in all sectors. Whether it’s integrating with a facilities manger’s CAFM system or liaising with a Local Authority housing tenant our dedicated team of experts are trained to ensure works are carried out efficiently and considerately. Our experience and knowledge of the unique environments where our work is performed is combined with great technical knowledge of our employees, many of whom are experts in building fabric, mechanical and electrical components, procurement and logistics and stock and stores management. This expert knowledge is allied with the use of leading edge works management solutions to provide our team, our clients and our clients’ customers with accurate meaningful information. We provide a full range of planned and reactive maintenance services including fabric maintenance, passive and active fire protection, statutory compliance and ad-hoc repair works. Please read more about our works management solutions here.